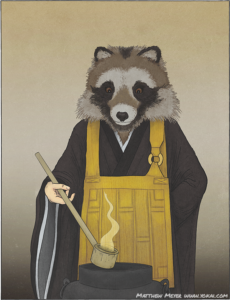 APPEARANCE: Shukaku was a tanuki who lived in disguise as a human priest. He worked at Morinji, a Buddhist temple in Gunma Prefecture for many decades. Shukaku is best known for his miraculous tea kettle, known as the bunbuku chagama, which he left to the Morinji as a gift. ORIGIN: Shukaku’s story has been told by Morinji for centuries, but different versions and variations have sprung up over the years. Its popularity spread during the Edo period thanks to a booming publishing industry, and it became well known across Japan. Although Shukaku is associated with Morinji, the structure of his story—a magical animal presenting a wonderful gift to humankind—is a recurring motif throughout Japanese folklore. LEGENDS: Morinji was founded in 1426 by a priest named Dairin Shōtsū. While he was traveling through various countries on pilgrimage, he befriended a priest named Shukaku, and they traveled together. After Morinji was built, Shukaku stayed on to act as a head priest there for many years. In 1570, an important religious gathering was held at Morinji. Priests from all over the country traveled to Morinji. When it came time to serve tea, the priests realized that they did not have enough kettles to serve such a large gathering. Shukaku—still serving the temple 144 years after his arrival—brought his favorite tea kettle to help serve the priests. This tea kettle was a miraculous object, for no matter how many times you dunked a ladle in it, it was always brimming with enough hot water to make tea. It also stayed hot for many days after heating it! The kettle was given the name “bunbuku chagama”—chagama being the word for tea kettle, and bunbuku meaning “to spread luck.” The name was a pun as well: the sound of boiling water is bukubuku, which sounds very much like bunbuku. Thanks to Shukaku’s marvelous tea kettle, the gathering was a great success. The bunbuku chagama continued to be used by the temple for many years. Shukaku, as well, continued to work at Morinji for many years after that. According to Morinji’s records, On February 28, 1587, a monk walked in on Shukaku while he was taking a nap. The monk noticed that Shukaku had a tanuki’s tail! Thus, Shukaku’s great secret was uncovered: he was not a human priest, but a tanuki in disguise. He had been living among humans for thousands of years. Long ago he had traveled through India and China. Eventually he met Dairin Shōtsū, who befriended him and brought him to Morinji, where he used his magic to serve the temple as best as he could. After his secret was uncovered, Shukaku decided it was time to leave Morinji. To apologize for the great shock he had caused Morinji, he gave them a parting gift: he used his magic to present the story of the Battle of Yashima, one of the final clashes of the Genpei War. To show their gratitude for all that he had done, the priests built a shrine to Shukaku, where he is still worshipped as a local deity. And the bunbuku chagama, which Shukaku left behind, is on display in his shrine at Morinji.